Fort Macon offers public access to the surf, sun and sand of the Crystal Coast—as well as a historic landmark. Located at the eastern end of Bogue Banks, one of a series of barrier islands along the North Carolina coast, the park is surrounded on three sides by water—the Atlantic Ocean, Beaufort Inlet and Bogue Sound. This area of undisturbed natural beauty is the perfect place to explore salt marches and estuaries vital to the coastal ecosystem. The park is also home to a Civil War fort with a history as intricate and unique as the waterways of the sound. 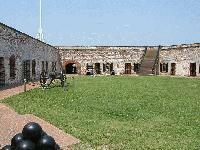 Visit Fort Macon to enjoy the land"s natural beauty and soak up some history. 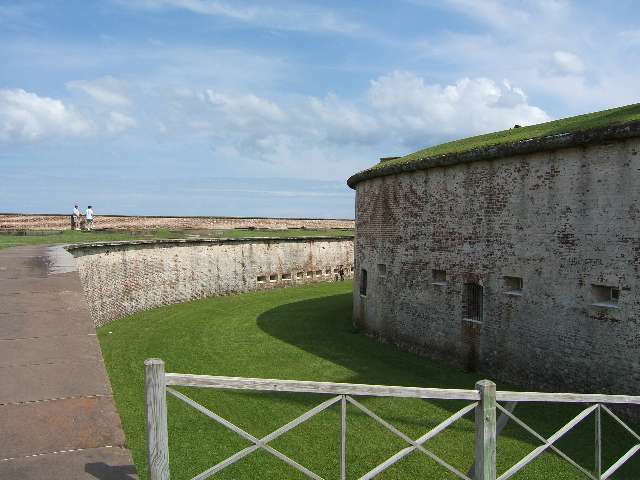 Five-sided Fort Macon is constructed of brick and stone. Twenty-six vaulted rooms (also called casements) are enclosed by outer walls that are 4.5 feet thick. In modern times, the danger of naval attack along the North Carolina coast seems remote, but during the 18th and 19th centuries, the region around Beaufort was highly vulnerable to attack. Blackbeard and other infamous pirates were known to have passed through Beaufort Inlet at will while successive wars with Spain, France and Great Britain during the Colonial Period provided a constant threat of coastal raids by enemy warships. Beaufort was captured and plundered by the Spanish in 1747 and again by the British in 1782. North Carolina leaders recognized the need for coastal defenses to prevent such attacks and began efforts to construct forts. The eastern point of Bogue Banks was determined to be the best location for a fort to guard the entrance to Beaufort Inlet, and in 1756 construction of a small fascine fort known as Fort Dobbs began there. Fort Dobbs was never finished, and the inlet remained undefended during the American Revolution. Early in the 1800s, continued strained relations with Great Britain caused the United States government to build a national defense chain of coastal forts to protect itself. As a part of this defense, a small masonry fort was built to guard Beaufort Inlet during 1808-09. This fort guarded the inlet during the subsequent War of 1812, but it was abandoned shortly after the end of the war. Shore erosion, combined with a hurricane in 1825, swept this fort into Beaufort Inlet by 1826. The War of 1812 demonstrated the weakness of existing coastal defenses of the United States and prompted the US government into beginning construction on an improved chain of coastal fortifications for national defense. 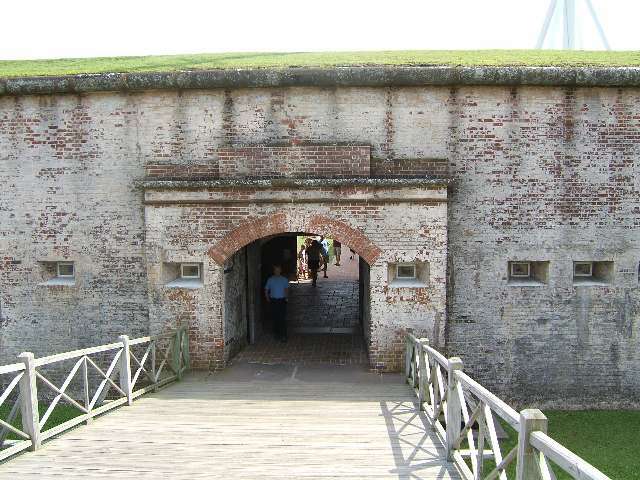 The present fort, Fort Macon, was a part of this chain. Fort Macon"s purpose was to guard Beaufort Inlet and Beaufort Harbor, North Carolina"s only major deepwater ocean port. Construction of the present fort began in 1826. Named after state senator Nathaniel Macon, who procured the funds to build the facility, the fort was garrisoned in 1834. In the 1840s, a system of erosion control was initially engineered by Robert E. Lee, who later became general of the Confederate Army. At the beginning of the Civil War, North Carolina seized the fort from Union forces. The fort was later attacked in 1862, and it fell back into Union hands. For the duration of the war, the fort was a coaling station for navy ships. Fort Macon was a federal prison from 1867 to 1876, garrisoned during the Spanish-American War and closed in 1903. Congress offered the sale of the fort in 1923, and the state purchased the land, making it the second state park. Restored by the Civilian Conservation Corps from 1934-35, the fort was garrisoned for the last time during World War II. Fort Macon was designed by Brig. Gen. Simon Bernard and built by the US Army Corps of Engineers. It was named after North Carolina"s eminent statesman of the period, Nathaniel Macon. Construction began in 1826 and lasted eight years. The fort was completed in December, 1834, and it was improved with further modification during 1841-46. The total cost of the fort was $463,790. As a result of congressional economizing, the fort was actively garrisoned only during the years of 1834-36, 1842-44 and 1848-49. Often, an ordnance sergeant acting as a caretaker was the only person stationed at the fort. The Civil War began on April 12, 1861, and only two days elapsed before local North Carolina militia forces from Beaufort arrived to seize the fort for the state of North Carolina and the Confederacy. North Carolina Confederate forces occupied the fort for a year, preparing it for battle and arming it with 54 heavy cannons. Early in 1862, Union forces commanded by Maj. Gen. Ambrose E. Burnside swept through eastern North Carolina, and part of Burnside"s command under Brig. Gen. John G. Parke was sent to capture Fort Macon. Parke"s men captured Morehead City and Beaufort without resistance, then landed on Bogue Banks during March and April to fight to gain Fort Macon. Col. Moses J. White and 400 North Carolina Confederates in the fort refused to surrender even though the fort was hopelessly surrounded. On April 25, 1862, Parke"s Union forces bombarded the fort with heavy siege guns for 11 hours, aided by the fire of four Union gunboats in the ocean offshore and floating batteries in the sound to the east. While the fort easily repulsed the Union gunboat attack, the Union land batteries, utilizing new rifled cannons, hit the fort 560 times. There was such extensive damage that Col. White was forced to surrender the following morning, April 26, with the fort"s Confederate garrison being paroled as prisoners of war. This battle was the second time in history new rifled cannons were used against a fort, demonstrating the obsolescence of such fortifications as a way of defense. The Union held Fort Macon for the remainder of the war, while Beaufort Harbor served as an important coaling and repair station for its navy. During the Reconstruction Era, the US Army actively occupied Fort Macon until 1877. 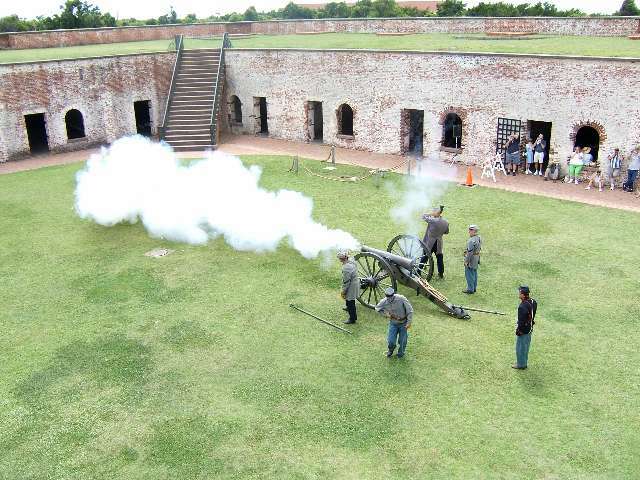 During this time, since there were no state or federal penitentiaries in the military district of North Carolina and South Carolina, Fort Macon was used for about 11 years as a civil and military prison. The fort was deactivated after 1877 only to be garrisoned by state troops once again during the summer of 1898 for the Spanish-American War. Finally, in 1903, the US Army completely abandoned the fort. 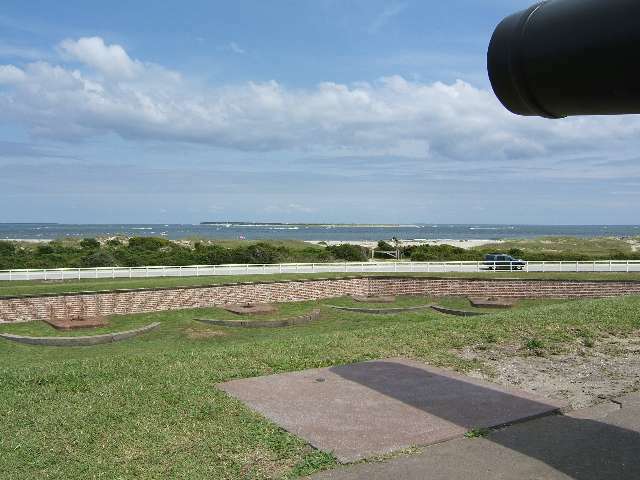 In 1923, Fort Macon was offered for sale as surplus military property. However, at the bidding of North Carolina leaders, a Congressional Act on June 4, 1924, sold the fort and surrounding reservation for the sum of $1 to the state of North Carolina to be used as a public park. This was the second area acquired by the state for the purpose of establishing a state parks system. During 1934-35 the Civilian Conservation Corps restored the fort and established public recreational facilities, which enabled Fort Macon State Park to officially open May 1, 1936, as North Carolina"s first functioning state park. 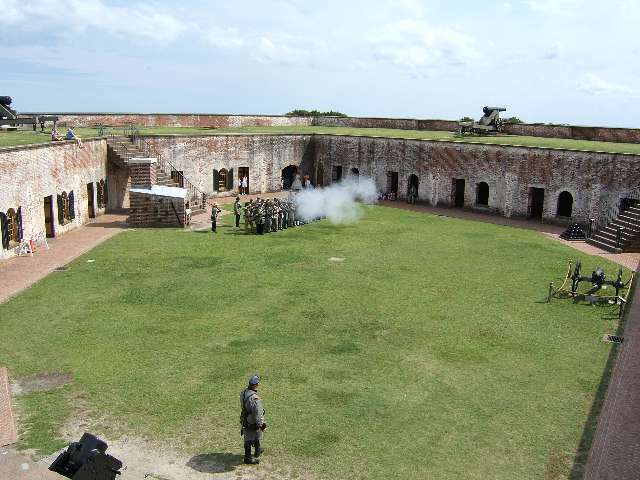 At the outbreak of World War II, the US Army leased the park from the state and actively manned the old fort with Coast Artillery troops to protect a number of important nearby facilities. The fort was occupied from December, 1941, to November, 1944. On October 1, 1946, the Army returned the fort and the park to the state. November–February, 8 a.m.–5:30 p.m. March, October, 8 a.m.–7 p.m. April, May, September, 8 a.m.–8 p.m. June–August, 8 a.m.–9 p.m. Swimming Area, 10 a.m.–5:45 p.m.
October–March, 8 a.m.–6:00 p.m. April, May, September, 8 a.m.–7 p.m. June–August, 8 a.m.–8 p.m. Fort, 9 a.m.–5:30 p.m.